The Child and I flew down to California to visit my father and stepmom last week, an experience made easier by direct flights and a funny coincidence: On the TSA screening line, I noticed that the agent testing people’s hands for explosives residue looked familiar. By the time I was close enough to read her name tag, she had recognized me, and threw her arms around me, and admired how much The Child had grown, before finally swabbing our hands and wishing us safe travels. Seven years ago, she was the dog rescuer who saved The Dog – the first dog she rescued – and helped me adopt him. I’d kept in touch with her sporadically since then, through Christmas cards and the occasional email. Lately, she has struggled with multiple jobs to make ends meet, and more recently, a divorce. I want to tell her things get better, but for a moment, they are. For our return trip, I foolishly select a 6 am flight, and since my father’s house is not actually very close to the airport, the night before the flight, The Child and I stay in a nearby motel with 24-hour shuttle service. The motel was nice, and the shuttle picked us up right at the door of our room, saving us the trouble of hauling our luggage across the parking lot. The driver loads our bags, heads for the airport, and after a few minutes, turns on the radio to Journey’s Don’t Stop Believing. It is the second time I’ve heard this song in two days. The first time, I sat with The Child on Universal Studios CityWalk, and as it played on the loudspeakers, explained to her why every time I hear this song, I think of the final scene of The Sopranos. She couldn’t follow what I was saying, since she’s never watched the scene or the series, and so when it played again on the bus, she didn’t even notice. I did, though, and brooded about death symbolism as the bus passenger next to me asked me where I was flying, and why; as The Child was selected for the speedy TSA precheck line, and I wasn’t; and as the plane took off, and I placed my feet flat on the floor and reminded myself, again, how to breathe. I didn’t do much on our first day back, but made up for it on the second by unpacking, rearranging my closet, and running a host of uninteresting but useful errands like stocking up on groceries, and filling my car’s gas tank. Then, finally, I made a simple dinner to end my simple day: I made soup. I’ve made lentil soup a couple of times, and though I like lentil soup when I eat it elsewhere, I’ve never managed to make one at home that I enjoy. My lentil soup efforts can be summed up in one word: bland. This time, though, I got lucky, with a review copy of Rose Water and Orange Blossoms by Maureen Abood. It’s a collection of recipes from Abood’s Lebanese-American childhood; more recipes can be found on her blog of the same name. I enjoyed the cookbook, with its lovely photography and intriguing but accessible recipes for things like yogurt marinated chicken skewers and fig jam with anise (doesn’t that sound lovely with cheese?). 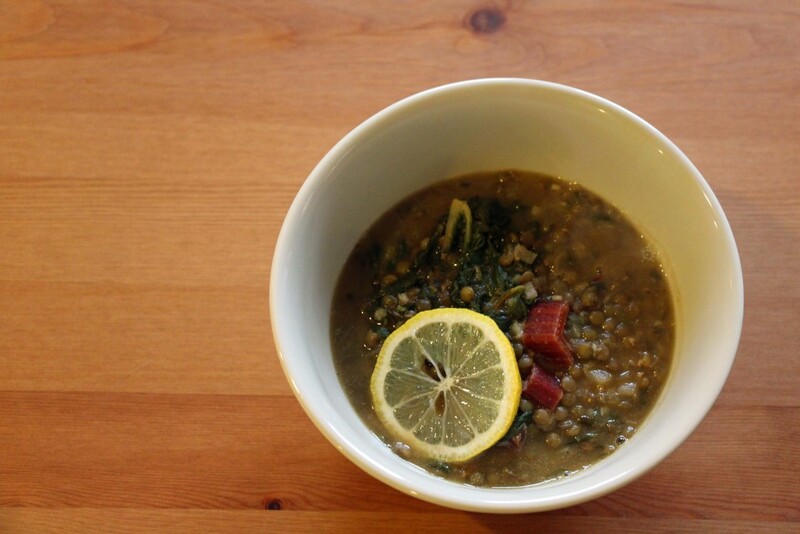 But the recipe that appealed to me most was Abood’s recipe for garlicky lentil soup with lemon, which, it seemed to me, might be the solution to my lentil soup woes. The soup is simple enough to make – cook the lentils in one pot, while cooking the garlic, onions, and chard in another, then mix it all up at the end. I loved the garlic, chard, and onion mixture, and could have eaten that by itself. I’d happily have it any day as a side dish, or perhaps underneath some baked eggs for breakfast. The lemon adds a delightful brightness to the soup. Abood uses 1/2 cup freshly chopped cilantro, which I’m not sure I’d do again, but mostly a personal issue as I was unable to locate fresh cilantro and had to use some “fresh” from a tube, which isn’t quite the same thing, especially when used in such quantity in a recipe. The recipe claims it makes ten servings; I suppose that’s possible if you have a thimble collection you want to show off at mealtime. I found it made four bowls of fairly thick, satisfying soup; there wasn’t much in the way of leftovers, so next time, I’ll double the recipe. This soup is a little adventurous, in its way, but also safe and soothing, the way soup should be. In a large pot, bring the lentils, water, and ½ tsp of the salt to a boil. Reduce heat and simmer until the lentils are just tender, about 20 minutes. Heat a large saute pan, and when hot, add the olive oil. Add the onion, chard, the remaining ½ tsp of salt, coriander, and pepper. Saute over medium heat until the chard stems and onions are soft, but not brown, about 5 minutes. Add the garlic and saute until fragrant, another minute or so, then add the cilantro, if using. Add the chard mixture to the lentils, stir in the lemon juice, and continue to simmer over medium heat for a few minutes. Turn off the heat and let the soup sit about 10 minutes. Taste and adjust seasonings, as needed. Oh, now that sounds like a fantastic winter soup. I’ve stuck it on my pinboard (with no picture!) to try. Carole, it’s really delicious and not hard! I stopped by and posted a link – nice to “see” you! Carole from Carole’s Chatter recently posted..Hee Hee! Or should it be Gee Gee?